Formerly known as "Doric's Quest," this content is available to both free players and members. 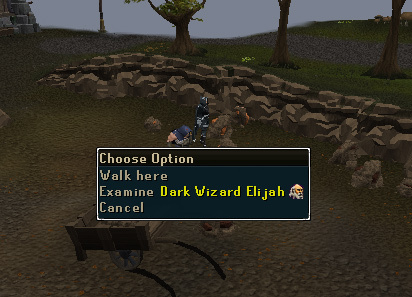 Speak to Doric on the road northwest of Falador to get started on this new adventure! Doric's smithy is suffering. His customers have been dwindling for some time and someone is about to take his last one. Help Doric find out who's behind his losses, and get him back in business. 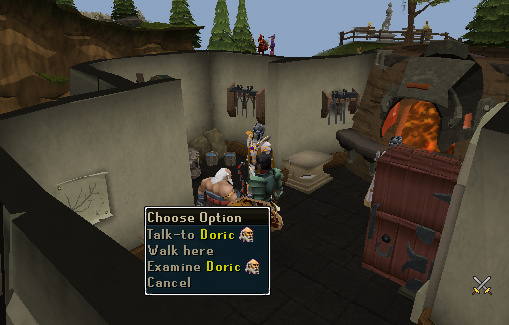 Speak to Doric, located in a small house north of Falador and just southeast of the Taverley gate. Items: Combat equipment, Teleports to Falador, Varrock and Rimmington (modified from house teleport tablets) if you haven't unlocked their locations on the Lodestone teleport network. When you first speak to Doric, you will receive a message saying that this quest is fully voiced. Turn on your volume if you'd like to enjoy this feature. Doric is in distress. His business is failing because Nurmof didn't send him his pickaxe order this week. He will ask you to help. Agree and he will be very grateful. It turns out that Sir Amik in Falador is a valued customer of Doric's. You will then plan to make some very useful mining equipment and then show it to Sir Amik to increase Doric's reputation. Since business has run down, you will have to get the materials yourself. Two copper and two tin ore are needed. 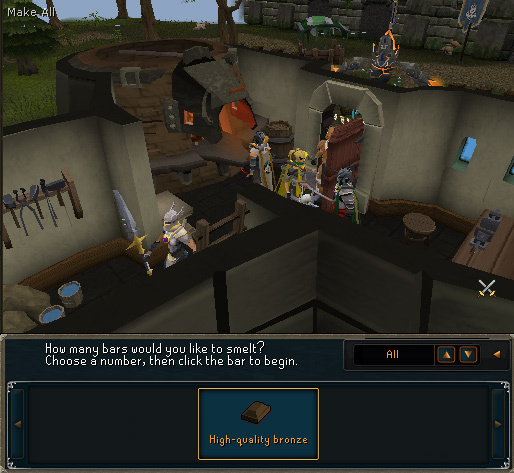 Apparently, the ores can only be taken from the most high quality places around RuneScape. You will receive an Ore bag and a Mining Sites Map to help you get only the finest materials. Tip: If at any time you need to return to Doric, the Falador lodestone is very useful. Simply walk along the northwest road from the teleport site. When you click on the map, a small map of the Freeplay world will show up. The red dots indicate where the mining spot is, and hovering over them will tell you the name. After you've mined at a spot, the dot will turn green. There will also be an arrow on your minimap pointing in the direction of one of the mines. The crosshair indicates your location. 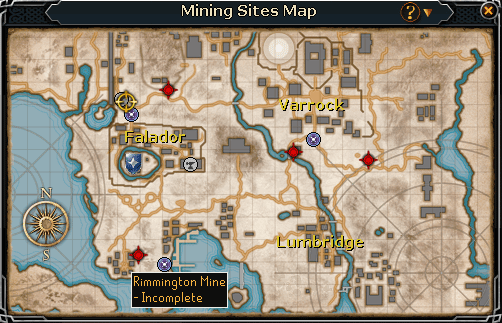 The mining sites you need to visit are Rimmington Mine, Dwarven Mine, and both Varrock east and west mines. 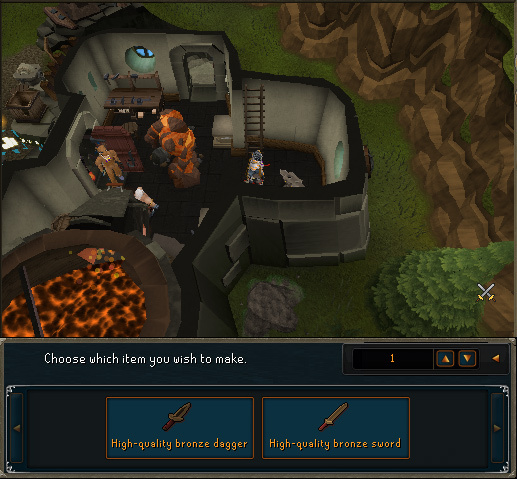 It is suggested to start with Dwarven Mine which can be accessed south of Ice Mountain or in east Falador. 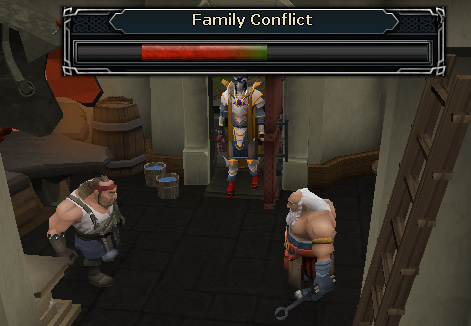 If you are a lower level, you may come in contact with aggressive scorpions if you choose to enter from Falador. When you successfully mine a rock, a level 2 Living Rock Brawler will pop up and attack you. Kill it easily and it will drop a high quality version of the ore you just mined. Always remember to pick up the ore that they drop, because the regular ores will not work for the quest! Next travel south to Rimmington's mine. A cutscene will start. Two wizards cast a spell on the rocks to try to stop players from extracting the ore. You can mine it anyway with no deadly consequences, so mine some tin ore, kill the Living Rock Brawler, and head over to Varrock's west mine near the Champion's Guild. 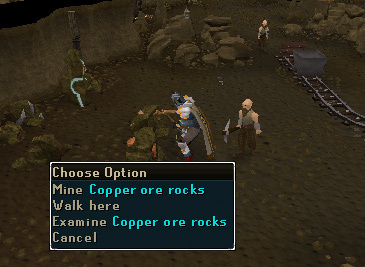 Tip: If you ever need to check how many ores you have left, click on the Ore bag and you will get a message in your chatbox showing the sites you have yet to mine. 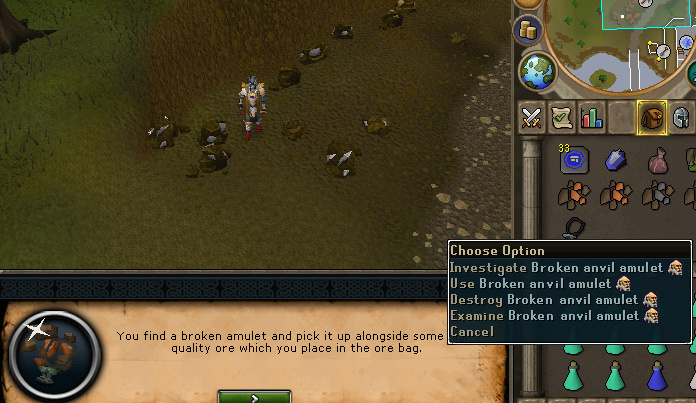 In the West Varrock mine, you will come across a Broken anvil amulet when you pick up the high quality ore. 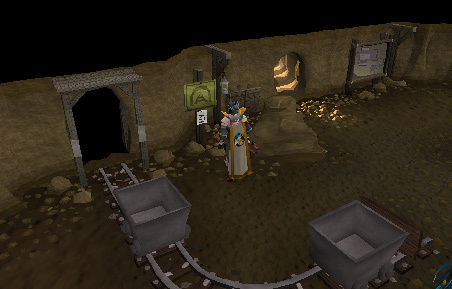 Walk east from here to the final ore location, Varrock's east mine. After mining the rock here, you will receive a book called "Wizard's Diary." You now have all the ores. Return to Doric to find out what happens next and to show him what you've found! 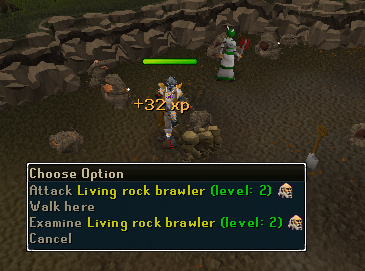 Doric will be surprised when you tell him about the Living Rock Brawlers. You will also tell him of the wizards who cast spells on the rocks. It turns out they were purposely trying to hurt Doric's business. He also analyzes the amulet you've found, which you will get back as a reward at the end of the quest. You will be assigned to make a Bronze sword and Bronze dagger to use as samples of the new weapon orders. You can only use the high quality ores, so you may drop any regular ores you have in your inventory. Withdraw the ore from the bag, smelt it in Doric's furnace and then smith the weapons on his anvil. No other anvil will work, as his is specially designed to work with high quality ore.
Make the high quality bronze bars by clicking on the furnace. Next make one Bronze sword and one Bronze dagger. Doric isn't satisfied yet and the weapons are not finished. You will have to go to the Artisan's Workshop in Falador and ask Aksel to finish the weapons. He will accept the task, as long as you do him the favor of asking Sten how the tracks to the Dwarven Mines are coming along. Sten is in the back of the workshop and down the stairs. Read the progress report on the east wall and then talk to Sten for the report. Return to Aksel to retrieve the weapons. Now it's time to show Sir Amik all your hard work. 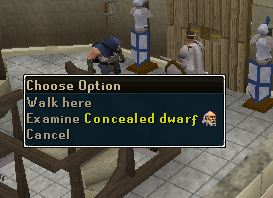 Speak with Squire Cerlyn in the ground floor of Falador's Castle west of the workshop. He will tell you that your time has been wasted, as another one of Doric's representatives is already meeting with Sir Amik. That isn't possible because you're the only worker. That must mean there is an impostor! Cerlyn will take the weapons from you and lead you to find Sir Amik. 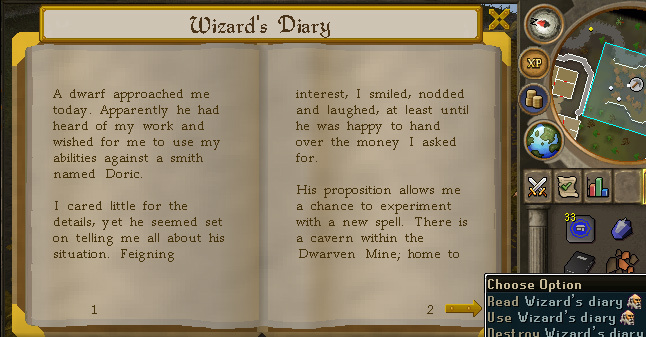 If you remember the wizards that put a spell on the rock while you were mining in Rimmington, you'll notice that the dwarf wizard is the one pretending to be Doric's employee. In a major plot twist, the impostor is Doric's son, Boric. He had just returned from Keldagrim and is trying to set up a small business. Sir Amik will not appreciate the situation, and you will take Boric to meet his father again. There will be a family conflict that arises and you will have to calm them both down. "Boric, tell Doric what you thought when Doric sent you away." "Doric, tell Boric why you sent him to Keldagrim." "Doric, tell Boric what it was like bringing him up alone." "Boric, tell Doric what you thought of Keldagrim." "Doric, tell Boric what you thought when Boric was born." "Boric, tell Doric what you thought about your education." After Doric and Boric are happily reunited and have settled their differences, speak with Doric and he will be very thankful for your help. Doric will reveal his new business, "Doric and Son". You will have the option of helping them out further with the business. If you choose to help, you will have a few tasks to complete. You will receive the high quality bars necessary to make the Ornamental Bronze Platebody and Chainbody as well as a sign for the shop. Use them on Doric's anvil to create these items. Next, go into the basement and clear the rocks to the west of the stairs. Give the items to Doric. An opening ceremony cutscene will play. The Gofannon amulet gives 500 experience while training Mining or Smithing. Members who complete the tasks assigned by Boric and Doric after the quest will be rewarded with further experience. 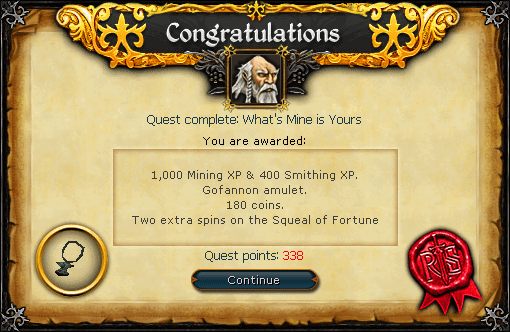 When you complete all of the tasks, you will gain a total of 183,500 bonus experience between Mining and Smithing.